PHNOM PENH (24 Feb 2019) – It took more than 120 minutes but in the end, Thailand prevailed to beat hosts Cambodia 5-3 on penalties in the second semifinals of the AFF Under-22 LG Cup 2019 here at the National Olympic Stadium. The score at the end of regulation and extra time was 0-0. With the win the Thais – who were the winners at the inaugural event in 2005 – will take on Indonesia in the final of the championship in two days. As expected, there was little separating the two teams well known for their attacking style. 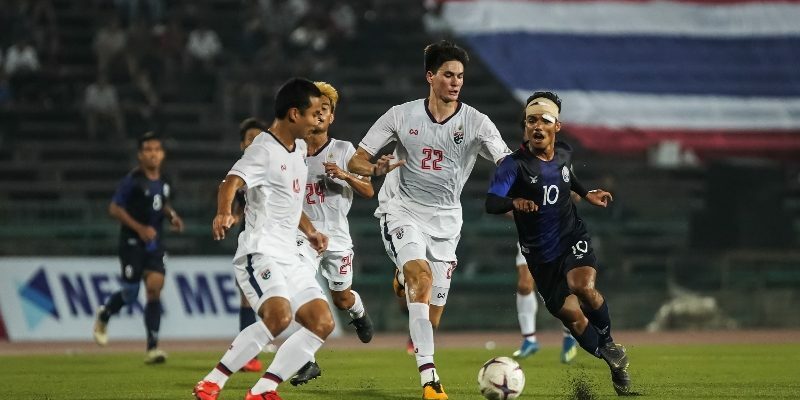 But with Thailand utilising lanky defender Marco Ballini at the heart of defence alongside captain Saringkan Promsupa, it was always going to be a struggle for Cambodia to make headways. Nonetheless the Cambodians, all pumped up with the attendance of close to 35,000 screaming fans, created a string of chances that could have changed the outcome early had the likes of Yeu Muslim and Narong Kakada been more sharp. At the end, Thailand were also on attacking mode with Ballini’s header coming close and Tanpisit Khukhalamo’s drive from 25metres narrowly missed the target as both teams then had to contend with extra time. As the clock trickled down to the penalty shootouts, Cambodia rocked the Thai crossbar with a well taken freekick from Orn Chanpolin while Thailand’s Kittipong Sansanit rising shot narrowly missed the top left corner of the Cambodian goal. In the penalty shootout, the miss by Sin Kakada in their second attempt after Teath Kim Heng had converted his, gave Thailand the confidence as they went on to convert all their penalties. The scorers for Thailand were Saringkan, Ritthidet Phensawat, Jedsadakorn Kowngam, Korawich Tasa and Ballini. The other two scorers for Cambodia were Kakada and In Sodavid.